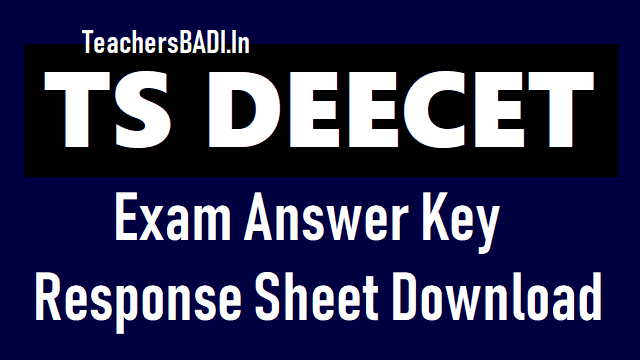 TS DEECET 2019 Answer key, Response Sheet download,Raise Objections: TSDEECET -2019 Results will be declared in June 2019 after release of Final Answer key, DEECET 2019 Answer key released. Telangana DEECET appeared candidates can download the TS DEECET 2019 Response Sheets and raise your objections through online mode at http://deecet.cdse.telangana.gov.in/TSDEECET/TSDEECET_HomePage.aspx. This Answer key can be used for rough assessment. Govt. of Telangana, DSE issued the TS DEECET 2019 Notification in April and invited the online applications through its tsdeecet official web portal from..-04-2019 to ..-05-2019 from the eligible candidates who intend to take admission into 2 year D.Ed course in Govt. DIETs and Private D.Ed Colleges for the academic years 2019-2020. Interested and eligible candidates were applied this DEECET stream and they were attended the TS DEECET 2019 exam, which was held on June 1 in all district of Telangana State. Appeared candidates can download the Response Sheets with Answer key from here. You can estimate your marks in DEEET 2019. The Answer key has been released and receiving the objections through online on this Primary key/ Preliminary Key(Answer key) from the deecet appeared candidates. After completion of this process, they will release the final Answer key of DEECET 2019 in this month. Few days after results will be released along with rank cards as per scheduled (TSDEECET -2019 Results will be declared on ../06/2019 . Step 2: In this page, click on the "Response Sheet"
Step 6:Click on the "Get Response Sheet"